Last Dance Giant Fragrant Trumpet lily bulbs are NEW! Only at lilyflowerstore! Her trumpet lily flower is white and green yellow center. Small orange speckles, too. 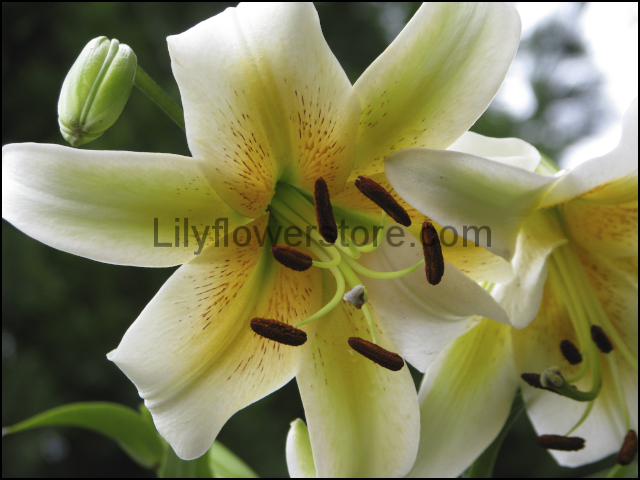 Last Dance Trumpet Lily is a must have best fragrant lily. Trumpets are the most fragrant lilies of all. Additionally, as evening daylight subsides and temperature start to cool. People passing for blocks away will wonder where the sweet fragrance is coming from! Very similar to Easter Lily. Strong stems, many gigantic flowers. Therefore, Last Dance should be staked. Trumpet lilies are one of the ten main types of lilies grown in the world. Aurelian, or trumpet, lilies are known for their huge, trumpet shaped blossoms. And impressive height. They’re a great addition to any garden. The introduction of the Regale Lily from China in 1903 gave rise to spicy-fragrant Chinese Trumpet Lilies. Also known as Aurelian Hybrid Lilies. The Chinese Trumpet Lilies produce huge, slightly recurved, trumpet-shaped flowers. And are graced with elegant, long anther-tipped filaments. The flowers can be 6″ or more in diameter. And length. Then becoming heavy, often bending or braking its’ stems. Also, trumpet lilies can get ten feet and taller. Additionally, requiring support. Trumpet lilies are extremely fragrant. Likewise, making them not as popular. The most common trumpet lily is the Regal lily. Coming from the Sino-Tibetan frontier country. It grows amid grass in windswept treeless well-drained valleys. And slopes. It was introduced to cultivation by the late E.H. Wilson. And it is a beautiful, fragrant lily plant! 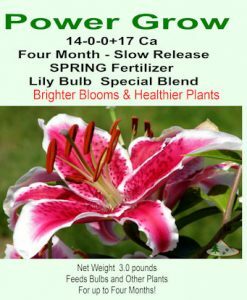 Grow Last Dance Giant Trumpet lily bulbs just like Orienpets. Good drainage is crucial with Last Dance Giant Trumpet lily bulbs. Choose a location with well-drained soil. Spots having heavy clay or one that remains damp are death for lilies. Clay soils can be amended by adding our Power Grow Potting Mix. But, if the surrounding soil is clay, planting spots act as a sump for excess water. Consequently, Last Dance Giant Trumpet lily bulbs will struggle to survive. Spots with a bit of slope allows excess rain to drain away. Likewise, another option is to provide raised beds. Therefore, allowing for a soil mix that is free draining. As well as rich in well seasoned organic matter. Also, potting mix needs 40% pumice or perlite. Plant Last Dance Giant Trumpet lily bulbs 2 ½ times the height of its’ bulb. Similarly, 3-inch lily bulb = 7 inches deep. Properly sited, Last Dance Giant Trumpet lily bulbs will produce bulb-lets. Also, increasing in size over time. Lightly mulch lily plantings before the ground freezes. Grow Rating Easy: Staking Recommended, Adapts to all soils well.